Continuing the 12 Authors of Christmas, here’s author Susan May Warren! Susan May Warren is the best-selling author of more than 20 novels and novellas with Tyndale, Barbour and Steeple Hill. A three time Christy award finalist, and three time winner of the Inspirational Readers Choice contest, Susan currently has over 500,000 books in print. 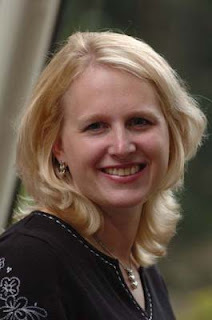 A seasoned women’s events speaker and writing teacher, she’s taught at the American Christian Fiction Writer’s conference for the past three years, and she runs a fiction editing service (www.mybooktherapy.com) training writers how to tell a great story. After serving for eight years with her husband and four children as missionaries in Khabarovsk, Far East Russia she now writes full-time while her husband runs a hotel on Lake Superior in northern Minnesota. Her most recent book is Chill Out, Josey! The hilarious adventures of a Minnesota girl who finds herself newly married, and pregnant…in Russia! (not autobiographical, or anything…) For more information, go to http://www.susanmaywarren.com. I was about six, and the stockings were hung over our chimney, and my father had built a cozy fire for Christmas eve. We’d done our obligatory puzzle (Santa always put in the last piece!) and had laid out the cookies for ole St. Nick, and in theory, we were supposed to go to bed. BUT, you see, the FIRE was still blazing! What if it didn’t go out by the time Santa passed by overhead? You can see my concern, and hence, the fit I threw, pleading with my father to put out the fire was entirely justified. I still consider it the year I saved Santa’s life. Living in Siberia, without extended family, we had to work hard to create traditions for our family. I took every scrap of family tradition we had an ramped it up to full setting – from decorating Christmas cookies on Christmas eve, to importing canned clams to make the request clam chowder soup, to refining the family recipes to fit Russian ingredients (and even creating a Warren family Christmas cookbook). I found the perfect puzzle and carted it with me around the world (see previous story! ), and even made homemade stockings for the children with their names on them. The only new tradition I created was the annual “open one gift” the night before (because it was SO painful to wait until morning!). The thing is – mom picks the present, and it’s always the same thing – Jammies! (Although I always pretend it won’t be, and the kids appropriate pretend to be surprised!) Hey, jammies can be suprising, right? Oh, how I longed for a tree in Russia (as evidence to all my Josey books, where Josey longs for a tree!) But Russians don’t celebrate Christmas on the 25th of Dec. (in fact, some don’t celebrate it at all). They do, however, celebrate New Year’s Eve with decorated trees, so my hubby would scour the markets and snap up the first tree he could find, using bringing home a Charlie Brown variety (because they also don’t have Christmas tree farms), on or about Christmas eve. Since moving back home, we’ve deicded to take advantage of having trees, and we put our tree up the first Sunday in December. But we still opt for the Charlie Brown variety – we live in 5 acres of wooded forest, and every year we tromp out in the snow and have a family wrestling match to see what tree we’ll pick. We call Sarah the Tree Police because she has final approval. Then we haul it in, and chop it down to size (this year it is 15 feet tall) and string lights. I give the children an ornament every year for Christmas, and I have an extensive collection of Christmas angels, and we listen to carols, eat Borscht (Russian soup) and then decorate the tree. There may or may not be a glass of my husband’s homemade raspberry wine involved in that process also, depending on the aforementioned wrestling match/argument about the tree and its worthiness. Mom can only take so much fun. Hmm...can I name a book? Because it’s hard to pick a favorite song, but for years I read “The Worst Christmas Pageant ever” to my kids. And then they got to perform it in the local playhouse. Now, we’ve moved onto Dave Barry’s, The Shepherd, the Angel and Walter the Christmas Miracle Dog. Hilarious! I’m up early, and I get to unload my stocking without mom or dad. Then we stare at the clock until 7am, willing it to move faster, until finally, finally it dongs the hour, and then we assault our parents with tidings of great joy. They stumble out of bed and do agonizingly unimportant things like make coffee and brush their teeth. And then we open gifts. It takes a long time because we pass them out, one at a time, in a circle, and give the appropriate reverence for each gift. About three hours later, when hunger is starting to kick in, we eat cinnamon rolls, egg casserole and those cute little smoky sausages. And then we take a nap with all our loot while mom cooks the turkey. Let’s see, that’s what I did last year. Now, something from my childhood? We have the same meal every year – Clam Chowder soup, homemade rolls, meats and cheeses, with decorated Christmas cookies. I usually make the cookies in advance, and the kids decorate them while I finish up with the soup. Then, we lay the table, (but don’t eat yet) and dress up for Christmas eve service. Then, we go out for the early service, and return in time to have hot wassail (or a variation thereof) and eat soup. Then we pass out the first presents (see story above) and, wearing said first presents, we open up the card table and do a puzzle. Now that we are stateside, I get a new puzzle every year - - usually about 750-1000 pieces. The goal is to finish it before bedtime (leaving one piece out for Santa). In years past, the kids would go to bed, and then Drew and I would stay up until roughly 3am, wrapping and assembling. Now, I’ve wizened up. I wrap all my presents BEFORE Christmas eve. (then again, I no longer have to hide them to keep my boys from unwrapping them early!) We fill the stockings, I put the casserole into the oven on time bake, and we drop into bed. Both! I do all my big shopping online (because I hate crowds when I’m on a mission) but all my incidentals at the Mall. I need to add here that I am 3 hours from the nearest mall, and I do all my Mall shopping at Thanksgiving in Iowa while visiting my in-laws. It’s one day of eating, two days of shopping. I think that’s a good balance for anyone. I recently watched the Nativity movie. And as the star shone down on Bethlehem, chills went through me, as if it was hitting me anew. The fact that God would come down in the form of a helpless baby, for the purpose of dying for our sins so we could be forgiven and join him in heaven…that takes my breath away. Frankly, I think it takes everyone’s breath away, and our minds are so unable to comprehend it, that we take our eyes off the truth, looking at it through our peripheral, distracting ourselves with presents and food and festivities. Yes, we’re celebrating. But somehow, I think that we should be on our faces, weeping. I think someday we will be. Turkey! Thyme Stuffing, corn pudding, sweet potato pie (from our stint in the south! ), broccoli and cheese, crescent rolls, mashed potatoes, gravy, green bean casserole (not the usual one), cream cheese jello salad (because I’m Minnesotan), wild rice casserole (again, Minnesotan), cream cheese pie (Andrew’s favorite), and French silk pie (my favorite). Cookies: Sugar, Ginger Snaps, Peanut Butter kiss cookies. We had a long toboggan, and me and my brother and my dad would climb on. My dad would sit behind us and wrap his legs around us. Our job was to hold his legs on, and usually I’d get his big sorrel boots that weighed fifty tons each. Then, he’d push off, and we’d barrel down the mountain of doom, screaming at the top of our lungs (okay, probably it was only me doing the screaming) the snow flying up into our eyes, our noses, stinging our cheeks. Usually we’d wipe out at the bottom, laughing, breathless, in a tangled mess of joy. After a couple hours of wild abandon, when we could no longer feel our toes or fingers, we’d trudge home to hot cocoa and succulent turkey. I’m still a sledder at heart. Always waiting for that next exhilarating, icy, dangerous ride down the Big Hill. I have recently decided that Christmas is a mother’s diabolical weapon to ensure the return of her children when they grow into adults. The more significance and tradition I infuse into Christmas, the more I’ve hooked the hearts of my children. I now have them believing they can’t have Christmas without mom’s soup, my Christmas rolls, my special cookies. And anyone who tells them otherwise is in very big trouble. Whatever your traditions are, wherever you celebrate the greatest gift ever given, have a merry one ~ from Susan May Warren and the Warren family! Camy here: Thanks for sharing, Susie! If you haven’t met her, Susie is a wonderfully fun person (well, you can totally see that from her interview answers)! 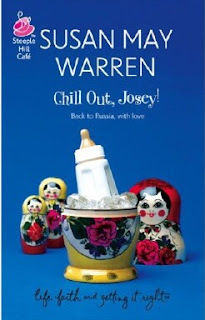 Everything’s Coming Up Josey was a fun romp in Russia, and I’m looking forward to the sequel, Chill Out, Josey! Thanks so much for sharing. I love the puzzle idea. I always start one christmas day. When we moved from the farm to the town we use to have a double chimney although the one in the lounge wasn't burning in summer (Christmas) the one in the Kitchen often did. and knowing how thin a chimney it was i use to wonder how santa could come also. Mum and Dad said he can come in the door. so every year we left the back door unlocked so he could come in. Thanks so much for sharing your memories. I have loved reading everyones Christmas memories and traditions. Ooooh...I'm so glad that Josey is getting another chance to share a chapter in her life...or in this case, a whole 'nuther book! I really enjoyed her first adventure. I guess as a former single missionary, I could relate to many aspects of the story.